Cossio Insurance Agency provides quality, low cost inflatable insurance for bounce houses, inflatable slides, jumpers & more! Whether you need Party Equipment Rental Insurance or have an indoor inflatable business, our staff specializes in finding competitive insurance quotes for your individual risks. Inflatable insurance programs vary with different companies and there are many companies that are pulling out of the industry...but not here at the CIA! We represent all of the best programs in the industry and are able to get you insurance coverage that you would be unable to find elsewhere. Our insurance quotes take into consideration your experience in the inflatable industry, your insurance track record and the units that you own and operate. This way we are able to provide you with affordable, low cost prices and the proper insurance coverage for your bounce houses & other amusement devices. Insurance for Inflatables is our specialty; we do more business with inflatable rentals companies and indoor centers than any of our other entertainment programs. This makes us experts on what it takes to get you the right insurance coverage the first time! Don't take our word for it...see what our customers are saying. Cossio Insurance Agency is known throughout the entertainment industry as the leading party rental insurance provider in the nation. Our friendly customer service, knowledge of the industry, online applications & free programs such as Digital Waivers for our customers, makes us stand out from the rest. On top of your regular inflatable insurance general liability policy there are some additional types of insurance that you may need to make sure that your business is fully covered. This insurance coverage is a requirement in most states if you have employees. It provides coverage for bodily injury, medical bills, loss of income, death for all employees, full time or part time. This provides coverage for your business property for fire, theft, vandalism on premises, or if Inland Marine while off premises. If you cannot afford to lose your inventory to theft or fire, this is an important coverage to purchase. You need to make sure your jumpers are protected! If you have Mechanical Bulls you will need to fill out a supplemental mechanical bull application. How much is insurance on a bounce house? The cost of insurance for the average start-up is $1790 (as of 2/22/19). This is the minimum premium (or the least amount you will will pay for inflatable insurance) You may be thinking "I just spent thousands of dollars on all these inflatables. Now you want me to pay how much for insurance?” You’re not alone in this thought. The fact is however, you can’t afford to run your party rental business without liability insurance. 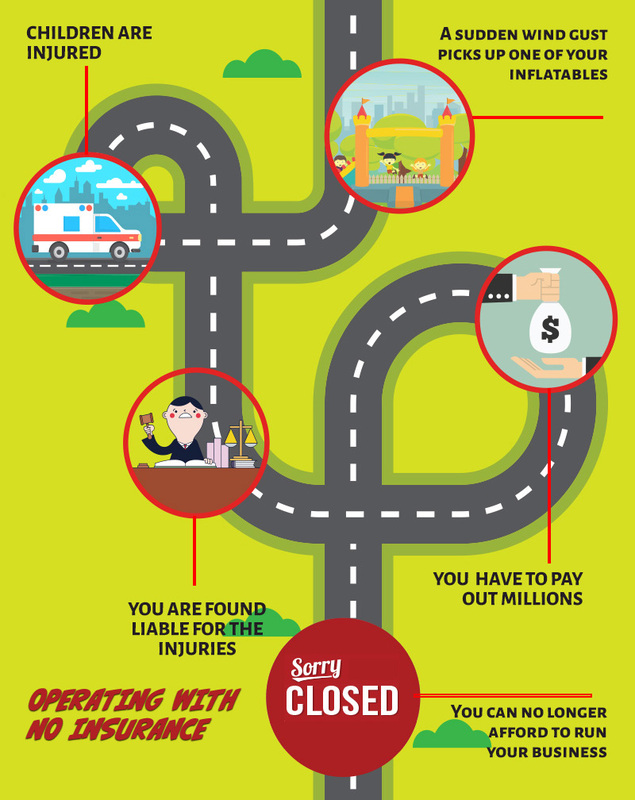 Just one accident could be enough to put you out of business if you are running your business without insurance. Devices that we see getting the most claims are Inflatable Slides, Mechanical Bulls, Trackless Trains, Sumo, Knocker Ball & Jousts. This isn’t to say that you shouldn’t have these items in your inventory. Just be aware that safety and supervision is very important with these types of items as well as any inflatable. Do I need insurance for a bouncy castle? The short answer here is yes. Although insurance is not a requirement in all states, bounce house insurance is something you can't afford to be with out. How much money can you make with a bounce house business? New party rental businesses usually start out with around 3-4 units which will bring in around $10,000 per year. If some of this income is used to add on a few more units a new company can expect to make around $15,000 for their first year. Of course as with any business the amount of money you will make will depend on a variety of factors. For example a party rental business owner in Florida or Texas can operate more months of the year than a business owner in New York. A certain amount of marketing is also necessary as is true with any business. Approximately what percent of new bounce house rental companies fail after the first year & why? We are seeing around a 10% failure rate for 1st year business & a 15-20% failure rate for 2nd year businesses. The party rental business has the potential to make a lot of money, so what are these businesses doing wrong? Here are a couple of things that contribute to the failure of new party rental business owners: 1. They don’t have a system marketing website Facebook page. 2. No business background. 3. In order to get business some owners copy another companies rates and lower than by 10-20%. While this gets them business in the short term this take 10-20% off of money that could have been used to reinvest in business. Why do I need loss runs? I don’t have any losses? We need to see your loss runs to get a clear picture of your claims history, to verify prior insurance coverage for underwriting purposes, to look for patterns of frequency or severity of loss which may cause them concern, and to calculate your loss ratio for underwriting purposes. "But isn't my word good enough?" We would love to be able to take your word for it. However, unfortunately people are not always honest. In order to protect ourselves and to be fair to every one we need to see your loss history in writing. Kind of like you need to show your pay stubs to get a loan or the way that a car insurance company would check your driving record. Does Cossio Insurance offer one day event coverage? We do offer one day event insurance at a minimum premium of $1,000. If you are looking for one day event coverage please call the office at 864-688-0121 to speak to one of our party rental experts. This is coverage for your equipment itself. This policy will cover your equipment against fire, theft or vandalism, where ever your equipment is (stored, transit, or at a party). How is the premium calculated for Inland Marine coverage? The premium will depend on the value of your equipment. 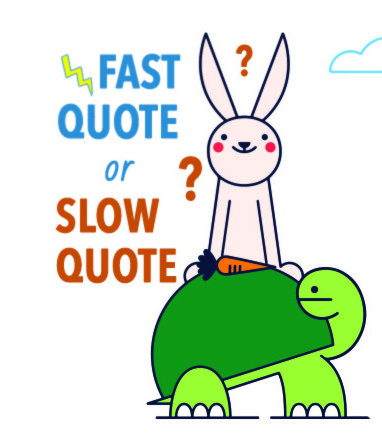 What do I need to get a quote for Inland Marine Coverage? Completed inventory list, serial numbers and value of all units. An individual or entity that is not automatically included as an insured under the policy of another, but for whom the named insured’s policy provides a certain degree of protection. A general liability policy only provides defense coverage for the named insured, which means the corporation, LLC, officers, members, employees or volunteers. If you have sub-contractors coming into your business or activity you need to request insurance coverage from them with limits of at least $1,000,000 per occurrence and name you as additional insured. We would recommend that you do this for their general liability, commercial auto and workers compensation. When do I need an Endorsement? An endorsement is typically required to effect additional insured status. What is Pay for Play? Pay for play is a phrase used for a variety of situations in which money is charged per a person for the privilege to (play) in the inflatables. For example if someone sets up an inflatable at a park and charges for each child to jump in the inflatable that would be consider pay for play. When an inflatable is rented out for a birthday party this is not considered pay for play. Even though the people are paying to use the inflatable, they are not charging each child to jump in the inflatable, so this is not pay for play. Can we insure Mechanical Bulls that are inside of bars? It is much harder to find coverage at an affordable rate for mechanical bulls inside of bars. For this reason, please give us a call to discuss your insurance options. Why is it harder to insure Mechanical Bulls inside of bars? It is harder to insure mechanical bulls inside of bars because of the risk of liability involved. 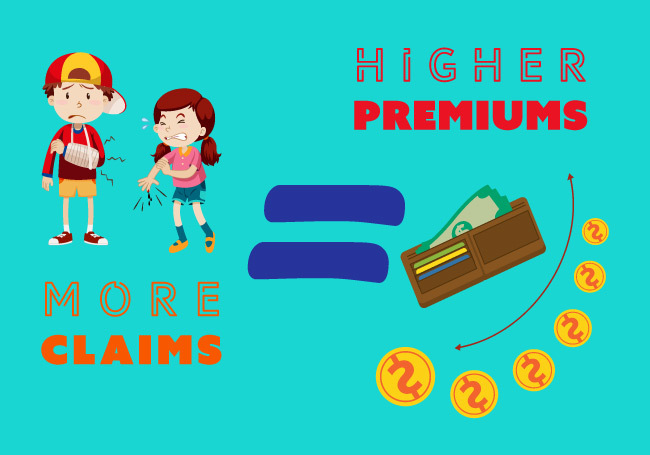 The fact that intoxicated persons will be riding the bulls makes the liability risk very high which means that the premium can get very high as well. Bounce house safety is the key to keeping your insurance premiums low. More claims = Higher Premiums for Everyone. By following some basic safety rules and knowing things to look out for, you can keep yours and everyone else's premiums from increasing. Lack of trained supervision: One of the biggest cause of claims that we see is lack of trained supervision. Do you just drop your devices off or do you make sure there will be attendants with every device? A trained attendant will drastically reduce your chance of someone getting hurt on one of your devices. Attendants should know the maximum number of children allowed in each device, pay attention to what is going on inside/on the device, make jumpers take off shoes and loose items and pay attention to the weather. Each device should have an attendant that is trained in safety rules for that device. For example with an inflatable slide attendants need to make sure children are coming down the slide one at a time and are sliding down on their butts. In a bounce house the attendant needs to make sure children are not bouncing against walls or on top of each other. Depending on the size/layout of the inflatable, some devices require multiple attendants. Bad Weather Another big cause of accidents occur because of weather conditions. One strong wind gust can send an inflatable airborne and cause many injuries and sometimes even death. Wind gusts of 20 mph have the ability to pick up a bounce house and send it flying. It is very important to check the weather everyday and make sure that devices are properly secured. Damaged Devices: It is important to check all inflatables before each use for any signs of damage. Tears, torn panels & netting, cracked vinyl are all things that should take that inflatable device out of commission. Inflatable Articles: Our blog has a lot of good information about accidents that can happen & tips on keeping your bounces houses safe. Klumsy Kanga Safety Video: Cossio Insurance Agency developed a short animation that teaches children bounce house safety. 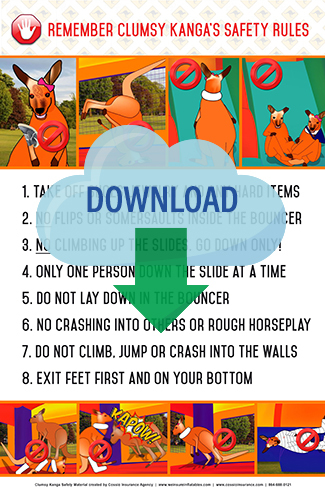 Klumsy Kanga goes through the bounce house safety rules in way that is more fun and interesting for children. It would be a great idea to show this to all your participants before you allow them to play on the inflatables. You can download the files using by clicking on the Kanga Poster icon with the download symbol. Digital Waivers: Waivers are important for the protection of your business. Although a waiver is not always assurance against a lawsuit, it is a vital tool in your defense if you were to get sued in the event of an accident. 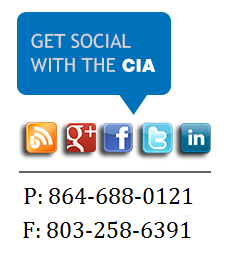 CIA customers have access to a free digital waiver program: www.digitalwaiversrus.com . We are unable to give any advice in terms of the wording of the waiver, this is something that is best done by a lawyer as we are not experts on the law. Party Rental Safety Checklist: Another tool available to our customers is the Party Rental Safety Checklist . This app encourages safe installation of inflatable devices by having the installer go through an installation checklist and take photos of the unit after it is installed. Having photos of the device as it was set up will protect you in the event that customers move the unit and secure it in a way that is not safe. The following documents include a sample waiver that you can use for customers, as well as templates for keeping track of your inventory. Below are links for Amusement Device & Inflatable Manufacturer's. These links are for informative purposes and are not necessarily endorsed by Cossio Insurance Agency. If you see any we should add to the list please let us know! Ninja Jump, the leader in licensed inflatable products, has chosen Cossio Insurance Agency to be a Ninja Jump preferred insurance provider for all their customers. We are pleased to be honored and chosen to provide insurance for their customers. Visit Ninja Jump's website and see the licensed inflatables they have to offer! Amusement Supply Company is your one stop for New & Used Amusements. They Buy, Sell and Trade any and all amusement attractions. Items they sell include inflatables, photo booths, Mechanical Bulls, Rockwall & more! Check out their website to see everything they have to offer. ClearView Financial finances new or used equipment such as rides, vehicles, trailers & other equipment for amusement businesses. ClearView is a member of IAAPA & has worked with major manufacturers of equipment, offering financing in all 50 states. Check out their website to learn more about their financing. InflatableOffice offers rental software to automate your business. Quotes, emails, surveys, contracts, pay & book online. Integrates w/Google Calendar, Authorize, Quickbooks. Customers of both the CIA & InflatableOffice can receive a 10% discount on their premium & 10% off an InflatableOffice subscription. Check out their website to learn more about their program. "Why didn't I Buy the Right Coverage?